Shug is a collage and mixed media artist and Charlotte native with a BA in art design and economics from Duke University and an MBA from UNC -Chapel Hill. After a banking career, she lived 14 years in Hong Kong and Louisiana, during which time she completed further studies in art. 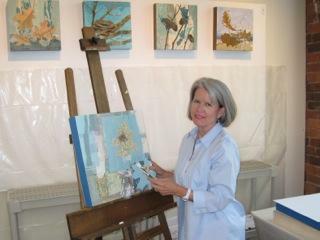 While living in New Orleans, she began to focus on creating art full time and had her first showing of collages. Since returning to North Carolina, she has been an Affiliate Artist at the McColl Center for Visual Art and maintains a studio in the historic South End. My collages combine imagery from a variety of sources with hand painted papers. My current focus is to examine nature up close using images of shells, leaves and other organic forms. Other collages include musical notes and imagery while some simply relate to the landscape displaying barns, foliage, red clay and various southern motifs. Many of my pieces bring a message from the past by combining historical documents and photographs into the contemporary setting of collage. Each collage is created from papers that are hand painted with fluid acrylic paint prior to assembly. Photographic images, stamps, stencils and monoprinted papers are often incorporated in the collage as well. Most of the initial colors used are transparent so as the layering process begins, the colors fuse together and make interesting combinations of their own. There can be as many as 8 – 10 layers or as few as two in the final piece.